¿Cómo resaltar / condicionar las fechas de formateo anteriores a los días 30 en Excel? Si tiene un rango de datos de fecha como se muestra a continuación y desea resaltar las celdas de fecha anteriores a los días de 30, ¿las resaltaría una a una manualmente? 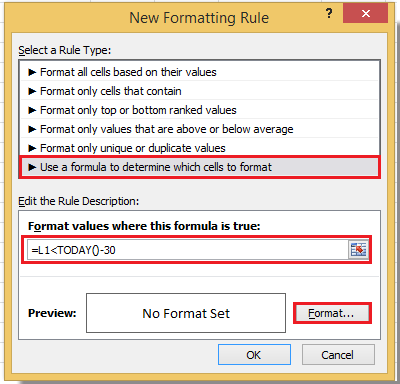 Ahora le diré una forma rápida de resaltar fechas anteriores a 30 días con la función de Formato condicional en Excel. Con la función de Formato condicional de Excel, puede resaltar rápidamente las fechas anteriores a 30 días. Tip: en la fórmula anterior, L1 indica la primera celda de su rango de datos, y 30 indica que tiene más de 30 días, puede cambiarlos según sus necesidades. 4. Hacer clic OK > OK para cerrar los diálogos Ahora se resaltan las fechas anteriores al día 30 desde hoy. Tip: Si se cambian los datos en el rango, también se cambia el resaltado. Hi there, I've searched far and low and have not yet found the specific formatting that I'm looking for. I would like to be able to have a list of all the 5th Sundays in the month, per specific year(There are always 4 months that have 5 Sundays every year). So since I don't know how to do that, I have a function that looks at dates (Jan - Dec of a year) and finds the first Sunday of the month, then adds 4 weeks to that, which would give me the 5th Sunday of the month. So some months the resulting dates actually show up in the next month - well all of the ones that don't have 5 Sundays. So now I was thinking if I could at least have conditional formatting where the "DAY" value in the date is above a certain number, then I could at least easily highlight the ones that have 5 Sundays. But I have not been able to figure it out. Can someone help me with that? 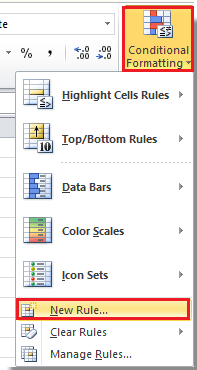 It seems to me it should be simple to have a conditional formatting that highlights all the days that are after the middle of the month, regardless of which month or year it is. I am using the Highlighting function with dates greater than 90 days, but then I have a completed date that I would like to use that will remove the highlight when a date is added to this cell. 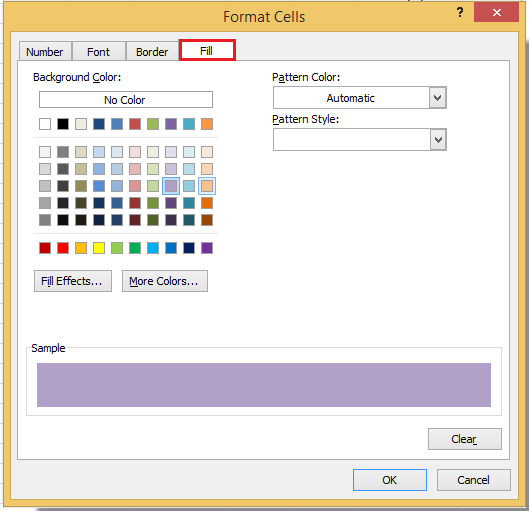 Example Due Date - Highlighted Cell - Completed Date. Is there a formula that will do this? Is it possible to compare 2 dates like; (first date > (second date+5)), and condition a cell colour based on the result? I got the above down but what if I only wanted to count weekdays? No weekends or holidays.